Fun fact: Did you know that more than half of the McNutt & Partners team works remotely? In the arena of digital marketing, we’re lucky that most of our work can be performed just as effectively for our clients from a remote setting. This not only lets us plant McNutt & Partners roots in various parts of the country, but also keeps our employees happy—as no one has to be uprooted who doesn’t want to be. While not commuting to a physical location every day has its perks, working from home does have its challenges. Whether you work remotely, know someone who does or are considering it, check out these tips for working remotely—in an effort to stay productive and content. Start the day with something you love. When you work from home, it can be easy to roll out of bed and feel like you have to roll right into your desk chair—not true! Instead of going straight to work, plan an activity that you enjoy to start your day. This could be going to the gym or for a walk, sitting down with a cup of coffee and the newspaper or even watching an episode on Netflix. With remote work often comes flexibility in hours, so take advantage of this fact by easing into the work day. Get dressed for work. Anyone who has worked remotely will tell you that it’s all too easy to hop onto a conference call in his or her pajamas (as long as it’s not a video call, which may require you to at least dress up your top half). Though not having to put on a three-piece suit or pencil skirt every day may be regarded as one of the perks of working from home, it can also set you up for unproductivity to stay in sweats all day. Getting dressed for the day—even if it’s not all out business attire—will give you the sense of purpose necessary to be a successful remote worker. Define a work space. 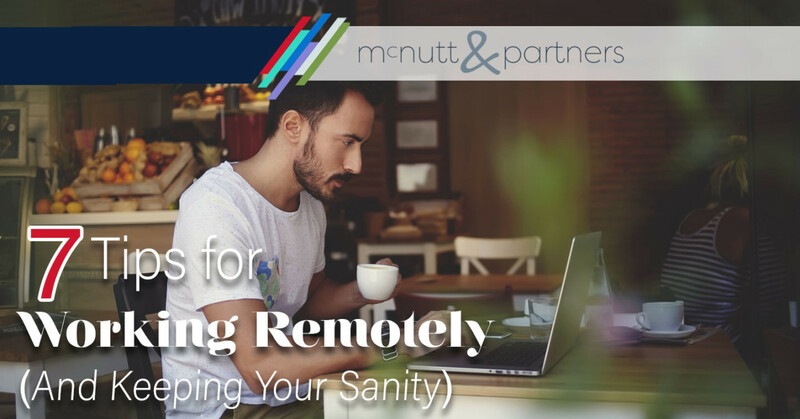 Maintaining your sanity while working remotely means defining a clear separation between your work space and your down-time/relaxation space. Desk in your bedroom? That’s a huge no-no. Psychologically, if you see your work area in a space that you should be relying on for relaxation, it will be harder for you to fully unwind. Conversely, if you are trying to work in a space where there are distractions (like the TV, for example), then you might find it harder to be productive. If you have a spare bedroom that you can transform into an office, then that’s ideal. If you simply don’t have room in your home to work remotely, you may have to turn to public spaces like a coffee shop or the library. You can also look into business incubators in your area that may have office or cubicle space to rent to individuals. Determine your working style. Everyone works well in different ways, and the great thing about working remotely is—how you work is up to you! For example, you may like to crank up the tunes and jam out while you work—so working at home may be your niche. On the other hand, you may enjoy the indistinguishable chatter of coffee shops, or maybe you prefer the dead silence of a library or noise-cancelling headphones. In addition to the environmental factors around you, you should also consider the time of day you work best (if you are not constricted by certain hours) and follow that accordingly. Create reasons to leave your desk. This one among our tips for working remotely goes for any sedentary job, but it’s worth mentioning here as well. Staying glued to your desk for extended periods of time can be physically and mentally taxing. Bathroom breaks are a given, but add to that by creating reasons to leave your desk. For example, try putting your phone in another room so that you have to get up to answer or check it. Or, set a timer every hour to get up and take a walk outside. Make yourself leave the house. When you aren’t scheduled to leave the house via a job you have to travel to, well, you can end up spending a significant amount of time at your house. Cabin fever, stir crazy—call it what you will, but it’ll happen. Make it a point to go out in public at least once every 24 hours (and no, the drive-thru line doesn’t count). Bonus points—don’t just go out in public, but go socialize. Socialization is one key factor that remote workers often miss out on. Despite the myriad of ways to communicate these days, the most meaningful interactions are still those that happen face-to-face. Take a fitness class, volunteer or attend a community forum—anything to push you to interact with other human beings. Know when to quit for the day. In office life, workers typically have their eyes glued to the clock waiting for 5 p.m. to roll around. When working from home, it can be easier to miss that signal for quittin’ time since, after all, you’re already at home. Though emails and notifications may continue at all hours of the day, make it a point to stop checking or turn them off at a certain time every day. Communicate this time to your coworkers so they know when you have checked out for the day. These tips for working remotely can help you stay out of a remote-working rut, but the work-from-home gig certainly has its benefits. Interested in remote work? Check out our job openings at www.mcnuttparters.com/careers!